An image depicting tip grafting can be seen below. The tip graft provides increased projection. The character of the nose is greatly defined by the contour of the nasal tip, and, as the central facial feature, the nose has a profound effect on facial aesthetics. Much of classic facial aesthetic analysis is based on a Greco-Roman ideal. Modern aesthetic values embrace the multiracial and multicultural nature of society and of beauty. Greater focus is placed on improving nasal and facial aesthetics while simultaneously preserving nasal and facial ethnicity. Similarly, modern aesthetic values embrace a more natural nasal appearance. In the past, reductive rhinoplasty techniques frequently focused on altering tip shape with techniques that ultimately weakened the structural integrity of the alar cartilages. A loss of tip support and projection was frequently inevitable. The modern trend is toward a stronger nasal profile and a more natural, unoperated look. Nasal tip projection must be evaluated in relation to overall facial structure. The surgeon can then determine whether preservation, augmentation, or reduction of tip projection is desired. Multiple methods can be used to assess tip projection in relation to various structures (eg, subnasale, alar-facial groove, a line from the nasion or glabella). One of the more useful methods of determining the degree of tip projection is the method described by Goode. A line drawn from the alar-facial groove to the nasal tip measures 0.55-0.60 of the distance from the nasion to the nasal tip in typical noses. If the distance from the alar-facial groove to the nasal tip is more than this, the tip is considered overprojected. If the distance is less than 0.55-0.60, the tip is considered underprojected. A final method to evaluate nasal projection is the amount of nasal projection in relation to the upper lip. Ideal nasal projection is present when 50-60% of the horizontal projection of the nose is anterior to the upper lip as measured by a horizontal line drawn from the alar-facial groove to the tip-defining point and a perpendicular line drawn vertically to the most anterior projection of the upper lip. Each of these methods has potential drawbacks. Upper lip length or the length of the alar cartilages may vary significantly, which may affect the estimated projection. Frequently, the nasofacial angle may be used to indirectly evaluate tip projection. However, each of these methods provides an additional measure of tip projection beyond a single nasofacial angle. A handful of properly used techniques can achieve deprojection of the overprojected nose. While controlling the level of rotation, these techniques offer sound functional approaches to effect deprojection. To help simplify the approach to deprojection, an algorithm can be used. Nasal tip surgery has become significantly more complex since the introduction of tip grafting and the many suture designs that followed the resurgence of open rhinoplasty. Independent of the surgeon's technical approach, however, is the need to identify the critical anatomical characteristics that make nasal tip surgery successful. Two nasal tip features require mandatory preoperative identification: (1) whether the tip is adequately projecting and (2) whether the alar cartilage lateral crura are orthotopic or if they are cephalically rotated (ie, malpositioned). Only 33% of the patient population had adequate preoperative tip projection, and only 54% had orthotopic lateral crura (axes toward the lateral canthi). Forty-six percent of the patients had lateral crura that were cephalically rotated (axes toward the medial canthi). Both inadequate tip projection and convex lateral crura were more common among patients with malpositioned lateral crura than in patients with orthotopic lateral crura. Tip projection can be reliably assessed based on the relationship of the tip lobule to the septal angle. Malposition is characterized by abnormal lateral crural axes, long alar creases that extend to the nostril rims, alar wall hollows, frequent nostril deformities, and associated external valvular incompetence. Surgeons treating the average spectrum of primary rhinoplasty patients see a majority (61%) who need increased tip support and a significant number (46%) with an anatomical variant (alar cartilage malposition) that places these patients at special risk for postoperative functional impairment. Correction of external valvular incompetence doubles nasal airflow in most patients. As few as 23% of primary rhinoplasty patients (the number with orthotopic, projecting alar cartilages in one series) may be proper candidates for reduction-only tip procedures. When tip projection and lateral crural orientation are accurately determined before surgery, nasal tip surgery can proceed successfully, and secondary deformities can be avoided. Overprojection results from the overdevelopment of one or more of the anatomic components of the nasal tip. A common etiology of overprojection is overdevelopment of the alar cartilages. This may result from either overdevelopment of the lateral, intermediate, or medial crus only or from overdevelopment of the entire alar cartilage. This deformity is commonly associated with thin skin. The nostrils are also frequently elongated. Tip overprojection may occur because of an elongated columella associated with excessively long medial crura. In this deformity, the infratip lobule is commonly insufficient, creating the effect of extremely large and disproportionate nostrils. Over development of the caudal septum may result in an overprojecting nose, and hypertrophy of the nasal spine may exacerbate this deformity. This tension nose deformity frequently results from involvement of the anterior and posterior septal angles and the caudal aspect of the septum. The overdeveloped quadrangular cartilage creates a pedestal effect, spuriously pushing the lower lateral cartilages forward. The lower lateral cartilages may be normal in size, hypertrophied, or even underdeveloped. Similar findings are observed with the pedestal effect of an enlarged nasal spine. Minimal nasal spine enlargement may further augment the tension nose deformity caused by an overdeveloped quadrangular cartilage. The pedestal effect of the overdeveloped septum usurps the role of the tip cartilages in tip projection and obliterates the normal supratip break. The resultant tension nose deformity tents the tip away from the face, tethers the upper lip, and blunts the nasolabial angle. This condition may also create abnormal exposure of the maxillary gingiva, particularly upon smiling. The forward projection of the nasal tip results in narrowing of the nostrils and flattening of the alar curvature. Overdevelopment of the caudal cartilage may also push the medial crura inferiorly, resulting in increased columellar visibility, especially with downward rotation of the tip with smiling. Iatrogenic overprojection may occur from overaggressive attempts to increase tip projection and is often associated with overrotation. This is commonly the result of borrowing the lateral crura through an interrupted strip technique to enhance the central limb of the tripod (ie, Goldman technique). Healing may be unpredictable, particularly in thin-skinned patients, and significant asymmetries and distortions may result in addition to overprojection. Collapse of the alar sidewalls early or even late in the postoperative period may also occur. Correction of iatrogenic overprojection focuses on exploration and accurate diagnosis of the precise deformity. Noniatrogenic overprojection usually results from various combinations of overdeveloped anatomic structures. Surgical correction generally focuses on weakening a combination of the major and minor tip support mechanisms to retrodisplace the tip. The overdeveloped anatomic components are also reduced in an incremental fashion in order to achieve the desired result. Lack of nasal tip projection has certain common characteristics. The columella may be short, but frequently other deficiencies are present in the nasal tip. Short medial crura may curve into small lateral crura without a significant segment of intermediate crura to provide caudal angulation and projection for the tip. This abnormality typically results in an acute nasolabial angle. The illusion of lack of projection may be created by a high radix, and deepening the radix can restore apparent projection without directly addressing tip projection. The tension nose deformity may produce the phenomenon of an overprojected nose and a tip with underprojected alar cartilages. The length and strength of the lower lateral cartilages do not determine tip projection in this deformity; instead, the height of the dorsal septum and anterior septal angle determine tip projection. The prominence of the pedestal can result in overprojection of alar cartilages that are actually deficient and may require reprojection of the tip after the pedestal is reduced. Correction of the underprojected tip focuses on preserving and/or restoring major and minor tip supports, reorienting the alar cartilages, and augmenting with cartilage grafts. Nasal tip projection is evaluated with careful examination of the nasal profile. Various methods of assessing tip projection have been described, including those of Goode, Crumley, Simons, Byrd, and Baum (see Problem). Each of these methods has limitations but provides supplemental information to the indirect measurement of tip projection based on an ideal nasofacial angle. The aesthetic triangle of Powell and Humphries (1984) is used to assess nasal tip projection in the context of multiple facial angles. In their method, a vertical line is drawn from the glabella to the pogonion, which should make an angle of 80-95° with the Frankfort horizontal plane. A line tangent to the glabella through the nasion intersects a line tangent to the nasal dorsum, which defines the nasofrontal angle (the nasal dorsal line should transect any dorsal hump to prevent distortion of the angle). As the central feature of the face, the nose both affects and is affected by overall facial proportions. Therefore, the aesthetic triangle of Powell and Humphries best determines ideal nasal proportions. The nasal base must also be evaluated carefully because its aesthetics affect and are affected by nasal tip projection. The alar base width should be 70% of the nasal length (as measured from the nasion to the nasal tip). The nasal base width also approximates the intercanthal distance or half of the interpupillary distance. The columella-to-lobule ratio should be approximately 2:1, and the width of the lobule should be 75% of the width of the nasal base. The long axis of the nares should be 45-60°, and the length of the nares should be approximately two thirds of the length of the columella. On lateral view, the alar-to-lobule ratio should approximate 1:1, and 2-4 mm of columellar show is ideal. Ideally, a double break of the columella is present. The nasal tip is the leading point and curves into the columella. The first curve is convex and reflects the lobule, while the second curve reflects the columella. The nasal tip is elevated slightly above the cartilaginous dorsum by 1-2 mm, blending into the supratip. This supratip break should be more pronounced in the female nose than in the male nose, where a straighter dorsal profile is desired. The ideal nasolabial angle also differs with gender, with more tip rotation aesthetically desired in the female nose than in the male nose. The ideal nasolabial angle in men approximates 90°. In women, slight upward rotation with a nasolabial angle of 95-110° is desirable. Preoperative assessment of nasal projection is not complete without evaluation of chin projection. Retrognathism may exaggerate the appearance of an overprojected nasal tip or give the false illusion of overprojection in a normally projected tip. Chin projection can be evaluated by dropping a vertical line from the vermilion cutaneous border of the lower lip perpendicular to the Frankfort horizontal plane. The pogonion should be in the same plane as the subnasale or vermilion border of the lower lip. Other methods of assessing chin projection can also be used. The zero-meridian method of Gonzales-Ulloa drops a line that intersects the nasion perpendicular to the Frankfort horizontal plane. The chin should approximate this line. A line from the glabella to the subnasale and a line from the subnasale to the pogonion define the Legan angle (12° with a standard deviation of 4°). A line connecting the pogonion and the most anterior part of the lip to the Frankfort horizontal line forms the Merrifield Z angle (80° with a standard deviation of 5°). An additional technique for assessing chin projection involves drawing a line through the most projected portion of the upper and lower lip. Inferiorly, this line should touch the menton in men and be within 2-3 mm in females. The nose should also be assessed in relation to the patient's overall facial structure and stature. As the central feature of the face, the nose should be proportionate to overall facial height and width. A nose with a high strong profile may complement a tall person better than a shorter individual, who may tolerate a shorter and overall smaller nose with good aesthetic results. The nose should fit both the face and the person. In every rhinoplasty, tip projection must first be assessed as normal, excessive, or deficient. A variety of methods are available for assessment, but most commonly the Goode technique is used (see Problem). The surgical goal to preserve, to enhance, or to decrease tip projection can then be determined. Many of the standard rhinoplasty incisions and maneuvers weaken the tip support mechanisms, which must be considered in surgical planning. If retrodisplacement of the tip and loss of projection is undesirable, these tip support mechanisms must be reconstituted. An important part of an aesthetically pleasing result is to ensure an adequate nasal tip positioned slightly higher than the proper dorsum, with the two tip-defining points in close proximity to each other, giving the nose a triangular shape from the caudal view. The term crural arch refers to the alar cartilage in its entirety. The components of the crural arch are the lateral crura and the medial crura. They are joined by a transitional segment of cartilage in the domal region, which is termed the intermediate crura. The tip-defining point refers to the highest point of the tip cartilages, which is usually the highest medial cephalic portion of the lower lateral crus. The tip should have 2 symmetric tip-defining points that are manifested externally by a light reflex. The caudal border of the lower lateral crus roughly parallels the alar rim near the apex of the nostril. The border variably departs from the alar rim and proceeds superiorly and laterally. It then indirectly attaches to the pyriform aperture laterally via dense fibrous connective tissue, frequently incorporating sesamoid or minor alar cartilages. The ala itself is primarily a fibrofatty structure, with the lateral crus providing little shape and structure laterally because of the oblique orientation of the cartilage. Fibrous connective tissue also constitutes the connection between the upper lateral and lower lateral cartilages (scroll region), which serves as a major tip support. Most commonly, the cephalic edge of the lower lateral crura overlaps the caudal margin of the upper lateral cartilage. The medial crura lie just below the columellar skin and are of variable convexity. They are connected by loose areolar connective tissue with variable divergence at the crural feet and toward the domes. The fibrous attachment of the medial crura to the caudal nasal septum serves as a major tip support. The caudal portion of the quadrangular cartilage also contributes significantly to the anatomy of the nasal tip. The caudal septum has 3 distinct angulations: the anterior septal angle, the midseptal angle, and the posterior septal angle. Surgically, the anterior septal angle is the most important. The interdomal ligament is a fibrous sling between the domes that connects the domes to the anterior septal angle; it is a minor tip support mechanism. The posterior septal angle is located just above the articulation of the quadrangular cartilage and the nasal spine. The posterior septal angle supports the feet of the medial crura. The membranous septum consists of the vestibular skin between the caudal margin of the quadrangular cartilage and columella on either side, with an intervening layer of subcutaneous areolar tissue. The nose can be divided into subunits consisting of the nasal dorsum, nasal sidewalls, nasal tip, alar lobules, and the soft tissue triangles or facets. The supratip refers to the area superior to the cephalic border of the tip-defining point. The nasal tip subunit includes both the tip-defining points (externally indicated by a light reflex) and the infratip lobule and columella. The infratip is the area inferior to the caudal border of the tip-defining point and superior to the upper end of the columella. The columella-defining point is the most anterior point of the columella in a profile view, commonly referred to as the double break. The columella-defining points should also be symmetrical. The alar lobules form a portion of the lateral nasal sidewall and are composed of fibrofatty tissue and devoid of cartilage. The soft tissue triangle refers to the soft tissue facet forming the nostril rim immediately below the tip-defining point. The alar cartilages of the nasal tip may be considered a tripod. Each lateral crus composes one lateral leg of the tripod, and the paired medial crura constitute the central leg. Alterations in any of the tripod limbs change the spatial position of the nasal tip. Shortening of the lateral limbs of the tripod results in rotation and deprojection of the nasal tip. Similarly, augmentation of the central limb of the tripod may increase nasal tip projection and rotation. Shortening of all 3 limbs serves to retrodisplace the nasal tip. The tripod concept, although an oversimplification of nasal tip dynamics, highlights the intimate relationship between projection and rotation. The tripod concept also highlights the effect that maneuvers performed on one limb may have on the spatial position of the entire nasal tip. Successful rhinoplasty depends on nasal tip support and its influence on nasal tip projection. 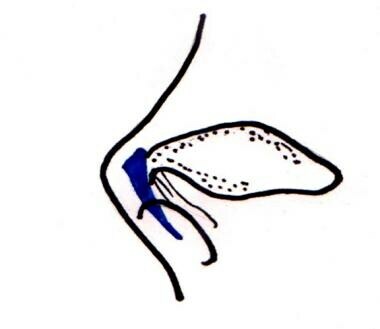 Most experts agree that the components of nasal tip support include the attachment between the upper and lower lateral cartilages, the attachment between the lateral crus of the lower lateral cartilage and the pyriform aperture, the attachment between the paired domes of the lower lateral cartilages, and the medial crural attachment to the caudal septum. In recent dissection evaluation, macroscopic study showed presence of dense fibrous tissue between the upper and lower lateral cartilages, dense fibrous tissue and sesamoid cartilages between the lateral crus and the pyriform aperture, and loose connective tissue between the paired domes of lower lateral cartilages, with no identified specific tissue between the medial crus and the caudal septum. Microscopic investigation allowed a more detailed analysis of these structures. Between the upper and lower lateral cartilages, dense collagen fibers ran in one direction and anchored firmly to each cartilage; this meets the histologic criteria of a ligament. Between the lateral crus and the pyriform aperture, intermingled collagen fibers and muscular fibers were present; this meets the histologic criteria of fibromuscular tissue. Between the paired domes of lower lateral cartilages, few fibers with abundant amorphous ground substances were present; this meets the histologic criteria of loose connective tissue. Based on the results, the authors recommend that the previously mentioned nasal tip supporting structures should be named intercartilaginous ligament, sesamoid fibromuscular tissue, and interdomal loose connective tissue, respectively. In addition, the authors feel that the loose connection between the domes of the middle crura and the absence of an attachment of the medial crura to the caudal septum may be one of the reasons the nasal tip of people of Asian descent is broad and unprojected with a wide base. Because rhinoplasty is an elective procedure, significant medical problems that could potentially increase the surgical risk are a relative contraindication. Any history of significant bleeding problems or a family history of bleeding problems warrants a more extensive preoperative evaluation. Any patient on anticoagulants must be able to stop these medications during the preoperative and postoperative periods. Robinson S, Thornton M. Nasal tip projection: nuances in understanding, assessment, and modification. Facial Plast Surg. 2012 Apr. 28(2):158-65. [Medline]. Powell N, Humphreys B. Proportions of the Aesthetic Face. New York, NY: Thieme-Stratton; 1984. Byrd HS, Andochick S, Copit S, Walton KG. Septal extension grafts: a method of controlling tip projection shape. Plast Reconstr Surg. 1997 Sep. 100(4):999-1010. [Medline]. Abbou R, Bruant-Rodier C, Wilk A, et al. Open rhinoplasty: influence of incisions, alar resection, and columellar strut on final appearance of the tip. Aesthetic Plast Surg. 2014 Dec. 38 (6):1077-82. [Medline]. Persichetti P, Simone P, Carusi C. Assessment of the 18-month permanence of onlay tip cartilage grafts following rhinoplasty. J Plast Surg Hand Surg. 2013 Sep. 47(4):281-5. [Medline]. [Guideline] Erdem T. Long-term effectiveness of projection control suture in rhinoplasty. Rhinology. 2010 Jun. 48(2):189-94. [Medline]. Kuran I, Tümerdem B, Tosun U, et al. Evaluation of the effects of tip-binding sutures and cartilaginous grafts on tip projection and rotation. Plast Reconstr Surg. 2005 Jul. 116(1):282-8. [Medline]. [Guideline] Leach JL, Athré RS. Four suture tip rhinoplasty: a powerful tool for controlling tip dynamics. Otolaryngol Head Neck Surg. 2006 Aug. 135(2):227-31. [Medline]. [Full Text]. Pastorek N, Ham J. The underprojecting nasal tip: an endonasal approach. Facial Plast Surg Clin North Am. 2004 Feb. 12(1):93-106. [Medline]. Spörri S, Simmen D, Briner HR, et al. Objective assessment of tip projection and the nasolabial angle in rhinoplasty. Arch Facial Plast Surg. 2004 Sep-Oct. 6(5):295-8; discussion 299-300. [Medline]. The double-layered tip graft provides projection and increased nasal length. Moving the tip graft up and down the columella controls the nasal tip. Cross-hatching the surface of the tip graft allows backward bending of the graft to prevent a gravestone deformity and to produce a natural looking infratip lobule. An overprojecting tip results in a gravestone deformity. The red segment should be resected to shorten the graft and correct the deformity. Cross-hatching on the caudal surface of the graft allows the graft to bend cephalically and produces a more natural contour.